An innovative guide to how great nonprofits achieve extraordinary social impact. What makes great nonprofits great? Authors Crutchfield and McLeod Grant searched for the answer over several years, employing a rigorous research methodology which derived from books on for-profits like Built to Last. 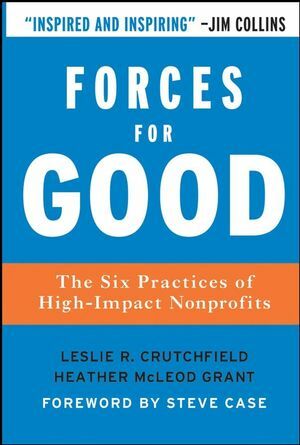 They studied 12 nonprofits that have achieved extraordinary levels of impact—from Habitat for Humanity to the Heritage Foundation—and distilled six counterintuitive practices that these organizations use to change the world. This book has lessons for all readers interested in creating significant social change, including nonprofit managers, donors and volunteers. Leslie R. Crutchfield (Washington, D.C.) is a managing director of Ashoka and research grantee of the Aspen Institute. Heather McLeod Grant (Palo Alto, CA) is a nonprofit consultant and advisor to Duke University’s Center for the Advancement of Social Entrepreneurship and the Stanford Center for Social Innovation. Crutchfield and Grant were co-founding editors of Who Cares, a national magazine reaching 50,000 readers in circulation between 1993-2000. Leslie R. Crutchfield is a managing director of Ashoka: Innovators of the Public, a philanthropic adviser, and a research grantee of The Aspen Institute's Nonprofit Sector and Philanthropy Program. She serves on the board of the SEED Foundation and resides in the Washington, D.C., area. Heather McLeod Grant is an adviser to the Center for Social Innovation at Stanford University's Graduate School of Business and to leading nonprofits. She is a former McKinsey & Company consultant, serves on the Advisory Board of Stanford Social Innovation Review, and resides in the San Francisco Bay Area. Written in an engaging, accessible style using a fresh and carefully chosen sample of organizations, this book provides powerful insights for all students who care about creating positive social change. Among the emerging themes are a focus on field building (not empire ruling), learning as a core attribute, creative capacity building, and the ability to focus on the solution rather than the problem. Forces for Good Read all the news and reviews about this amazing force for good, find out more about the sponsors, read Leslie and Heather's blog, and find out if they'll be traveling to a city near you.